It’s always important to catch up with your friends that you haven’t seen in a while. Whilst looking for somewhere to eat in Leeds it’s fair to say that there is an abundance of choice and a quick Google of early bird/pre-theatre etc. etc. will give you near unlimited choice of Leeds exquisite dining scene. 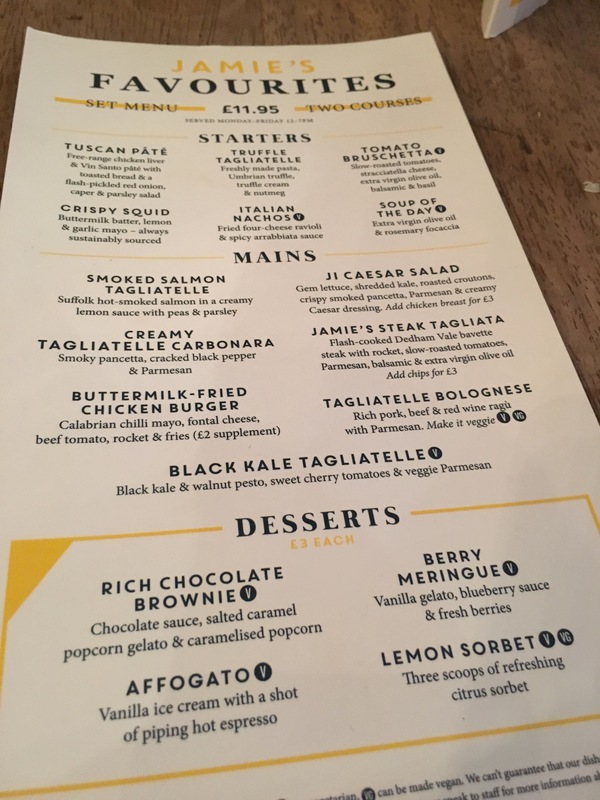 We settles on Jamie’s Italian on Park row, I’ve visited many times in the past and whilst value for money it can be a mixed bag in quality of food yet service is always decent enough but there is room for improvement with their front of house. After finding out there wasn’t the beef cheek special we decided on picking from the early bird. Three courses for £14.95 (dessert, £3 inclusive). I started with the Tuscan pate. Nice enough but the ratio of toasted bread to pate was frustrating. This said, the house rose is always a good choice. The main meal was Carbonara, (and before I have angry people saying ‘you don’t know what a real carbonara is… I do.) Towards the end of the bowl there was more flavour, and whilst I respect that they make their pasta fresh every day, it was the most disappointing pasta dish I have tasted in my adult life. The chocolate brownie to finish was the nicest course by a long mile but the stale popcorn was quite literally the icing on the cake. I know Jamie’s Italian has had a rough ride recently so I really wanted to like this but it was bland at best and if it wasn’t for the excellent company it would been a write off all round.